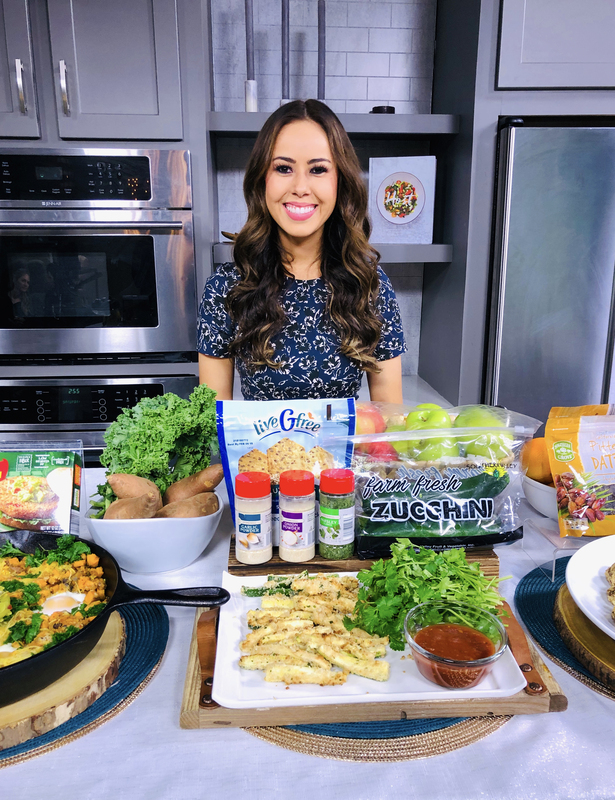 Whether your new year resolution is to eat better, lose weight or save money in the New Year – you can do it all at ALDI that is why I am so excited to partner with them today. Today on Good Food Friday, I shared three healthy ALDI recipes you can make at home starting with the Harvest Breakfast Skillet which is a great breakfast for dinner option. It’s made with fresh vegetables like kale and spaghetti squash and the Quinoa Crunch veggie burgers, which are part of the ALDI-exclusive Earth Grown line which features vegetarian and vegan products like burgers and shredded cheese. What I love about this recipe is that one serving meets your entire daily vegetable recommendations which is about two and a half cups. Next I shared a nutritious take on French fries – oven-baked zucchini fries. They taste fried but are made with a whole grain oat and herb breading. I love that ALDI has a wide range of high quality, fresh produce including organic options – so if you don’t want to make this recipe with zucchini, you can use potatoes or your favorite root veggie. Next, I shared a nutritious sweet treat – cocoa mocha oatmeal cookies naturally sweetened with dates and apples. I recommend enjoying these with a glass of almond milk on the side! ALDI has one of the largest selections of milk-alternatives in the country including organic almond, soy and coconut– which is my favorite. I ended with a few fun kitchen gadgets that are all on sale this week at ALDI – a Mandoline Slicer for 8.99 and a food dehydrator for just under $25. You can find them in the ALDI finds section – which is where they introduce new premium food and household products each week, for a limited time and at a low price. You can find all these better-for-you recipes at ALDI.us. You can watch the segment on ABC New 4!